We’re back with Week 2 of 5 Fridays to Funemployed, and I’m happy to say that a bunch of people have hopped on the gravy train since last week…WELCOME! We have snacks and Pine-Apple-Ritas in the back. So last week was all about finding your niche—AKA your specialty—that’ll be the biggest selling point for your business. To briefly recap (if you missed it and would like to catch up, just shoot me a message), instead of marketing yourself as a "Graphic Designer," market your special focus on custom business cards or unique wedding invitations. Instead of “Photographer,” you’ll market yourself as a Professional Headshot Photographer. This week, though, we’re diving into what to do once you’ve found your niche and are ready to shout it from the mountaintop: PLATFORM. 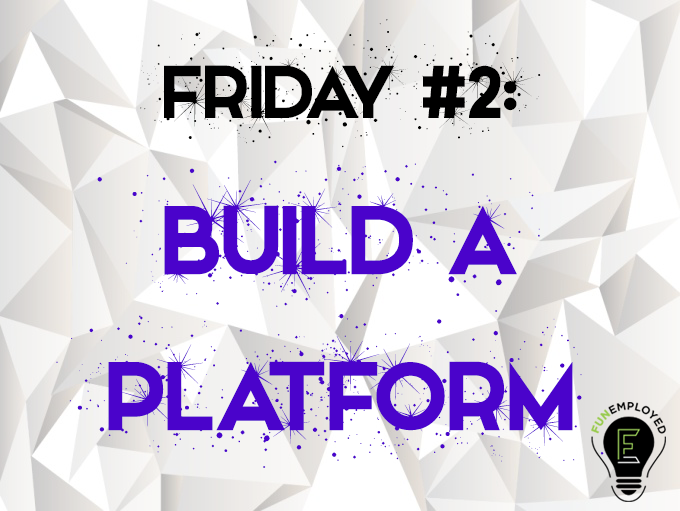 The platform I’m referring to is YOUR platform, and it includes social media channels, your website, and email. The reality is, we’ve all (hopefully) got a platform. For most of us, that platform is social media: Instagram, Facebook, Twitter, LinkedIn, Snapchat. And whether you choose to believe it or not, YOU ARE A BRAND, and the things you post on those platforms all tie into your unique brand identity. What do you want your brand to be? When someone comes to your platform, what conclusions do you want them to draw about you? This also goes for your business. When someone stumbles upon your business page because you used a hashtag associated with your industry, will they know what you do? Will they be captivated enough to learn more? Is your message clear? This brings me to another point: WHAT IS YOUR MESSAGE? Do you have one? Sure, your business does XYZ, but what is your message? My business offers coaching. My message is: making a living doing what you love is possible, and I’ll help you get there. There’s another business in my network who does coaching (I’ve actually had a coaching session with her), and her message is: business owners have a lot on their plate and floating around in their mind, I help them declutter. Even if our coaching work overlaps (and it does), our messages are clear and different. This is why I (for the most part) encourage separate business/personal profiles. Unless your persona is a core part of your business, no one cares to see your mirror selfies, #OOTD looks, and random memes you found funny. It muddies the clear message you’re trying to convey. Example: I utilize @LeapInnovativeGroup’s Instagram to highlight the work we do, the amazing things happening with our clients, and the Funemployed community we’re building through The People’s Playlist. If someone wants to know what I’M doing, as in Leap’s CEO, or what I find funny, or what ‘Rita flavor I’m drinking that day, I tag my personal page so they can get a glimpse into my personal life. But I keep them separate on purpose. Think of one as the behind-the-scenes footage and the other as your highlight reel. Up close and personal on the personal page, pretty and polished on the business page. Two messages. Of course, you can pepper in your business dealings on your personal page, because you already have an audience that should be leveraged for your benefit, but again, unless your personal image is a core part of your business (i.e. Bloggers, makeup artists, etc. ), I advise clients to build a separate platform. Social media channels are all owned by major companies whose guidelines change and whose software can glitch. What happens if your page is one day hacked and deleted? What happens if the site shuts down? What if your account is somehow compromised? You need to own a home for the work that you do. Utilize Squarespace, Wordpress, Blogger, Wix, etc. to start showcasing your talents and services on your page. There should be SOMEWHERE that people can click to from your social media channels in order to learn more, read more, and/or book you. And start small; you don’t need an elaborate site until you’re ready to invest in one (more on that next week), but you absolutely need a website. Put up a photo gallery of your work, list what you’re offering, include a headshot and brief bio so they know you’re not a Russian bot. If you want (not always necessary), list your prices. The social media algorithms change constantly, so there’s no telling how many people are actually seeing your posts when they go up. That means a huge chunk of people didn’t see that post about your exclusive offer, didn’t read your big announcement, don’t know that you’re taking new clients. Here’s where email comes in. When I send out my weekly emails, I know exactly how many people received it, how many people opened it, WHO opened it (I’ve got my eye on you), and who clicked around to learn more. There’s no crossing my fingers and praying to God that when I click “Post” my followers will see it. Email allows you to communicate directly with your supporters, clients, and prospective clients with offers and news. I use MailChimp, but there are a host of other services that allow you to customize emails, build lists, and view reports of how well your emails are doing. Mailing lists & websites take time to build, but trust me—it’s so worth it. Examine your social media platforms. Is your message clear? Are you selling yourself appropriately? Is your brand identity strong? Do people know exactly how they can spend money with you? If not, make notes on what key changes you need to make and begin executing. Next, if you haven’t already, get started on your website. Start small, with something simple, easy and straightforward. We will work on the pizazz later, but begin the foundation. Make sure you’re showcasing your work, explaining your services, and introducing yourself with a concise bio. If you’ve got 1 & 2 down, start on your email list. Decide which email service you want to use. Then, utilize your social media channels to announce that you’ve now got a mailing list and encourage people to sign up. Start a list of topics you plan to cover to keep them engaged and promote your product/service. One step at a time. If at any point you need assistance with the homework assignments and want help figuring and sorting it all out, remember that I’m offering an exclusive consulting rate for anyone who signs up during 5 Fridays to Funemployed. $150 (down from $300) 2 hours of consulting, and all the tips you need to get started on your Funemployed journey. Just shoot me an email and we can set it up! Whether you're already Funemployed or flirting with the idea, subscribe to our mailing list and join our community! Thank you for joining Funemployed!